While I was traipsing around in the northern Manitoba tundra (upcoming blog), the Society of Animal Artists had their opening weekend. I am honored to have won the Ethology Award. 1. the science of animal behavior. 2. the study of human behavior from a biological perspective. From the awards presented, best 2-D, best 3-D, President's Award, etc, I can't think of an award I would feel more honored winning. 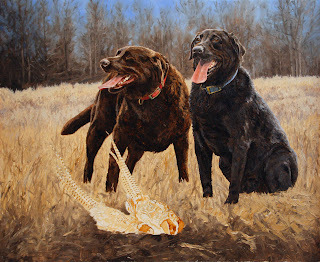 When my client received the painting, he said it looked just like his "huntin' buddies" and that he would "treasure the painting long after they were gone." Taking the time to meet his dogs, taking good reference photos, working out various compositions, using my own pheasant reference, and then having the freedom to paint the story I saw made this painting come to life for me. And for my client and for me, on this mission we both won. Working with the pheasant reference was a challenge. My client had pheasant reference, but not at the perspective, detail, or interest which I needed. 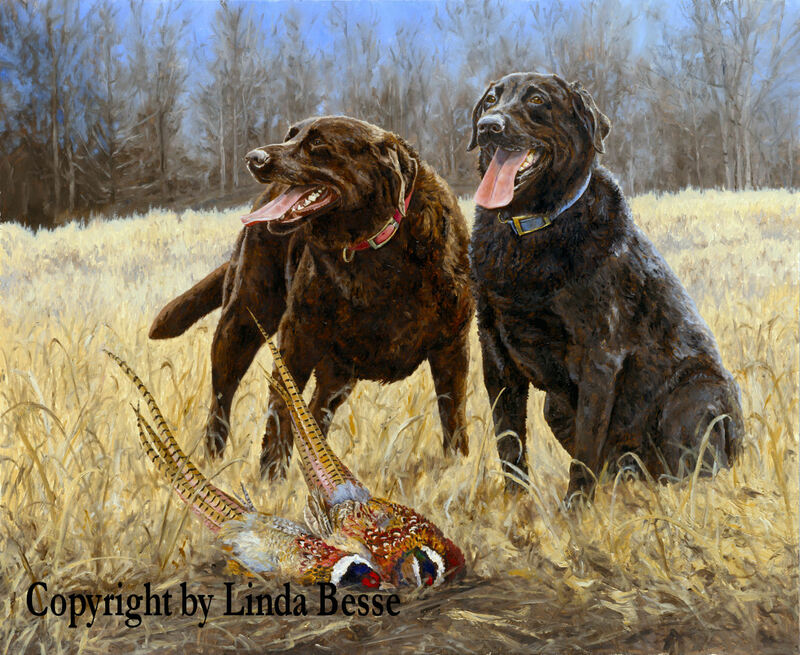 I had South Dakota pheasant reference from my husband's hunting trips, other live pheasants which I had photographed, and two mounts in our rec room of some monster South Dakota pheasant. Long tails, nicely mature roosters. At this point, I also see that the tails of the pheasants in the painting are fine, but not as magnificent as the ones I have. 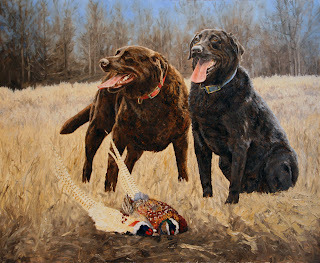 Well, why not make them the finest pheasants to go along with these beautiful dogs. 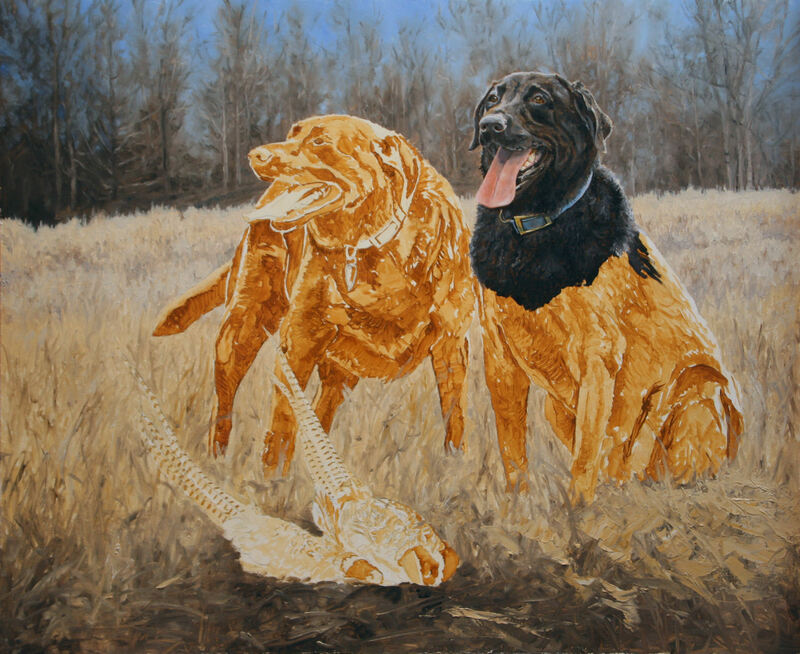 While the dogs may have been painted, the mission is only half completed. The painting needs to come together as a unified story. Time to work on the pheasants. 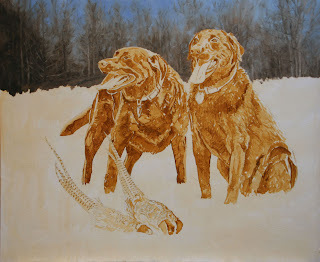 One of the reasons I wanted the chocolate lab standing is that I feels it makes for a more dynamic composition. Two dogs sitting would be OK, but this way I can work in different postures and the overlapping of the black lab on the brown lab. 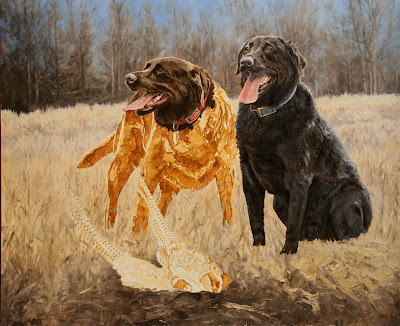 Once again, I am challenged to make this my client's chocolate lab, Layla, and not just any chocolate lab. This is when the mission gets more difficult. I am not painting a black lab, I am painting Josie. A particular black lab. The image has to sit like her, look like her, feel like her. 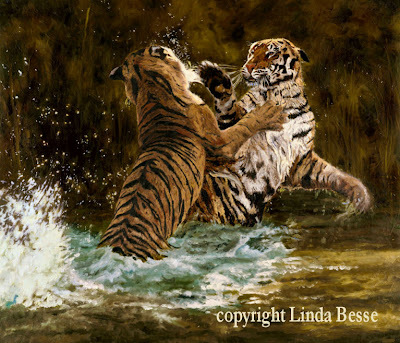 That is why I find it so important for me to spend time with the animals I paint. 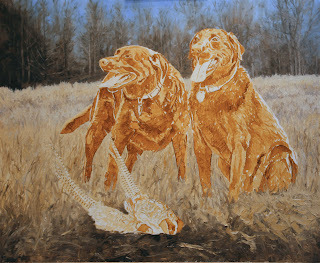 My client had some reference photos of the place he usually hunts with his dogs. Several of the shots had taller trees in the background and blue sky peaking through. Right away, I knew I wanted that feeling of distance. 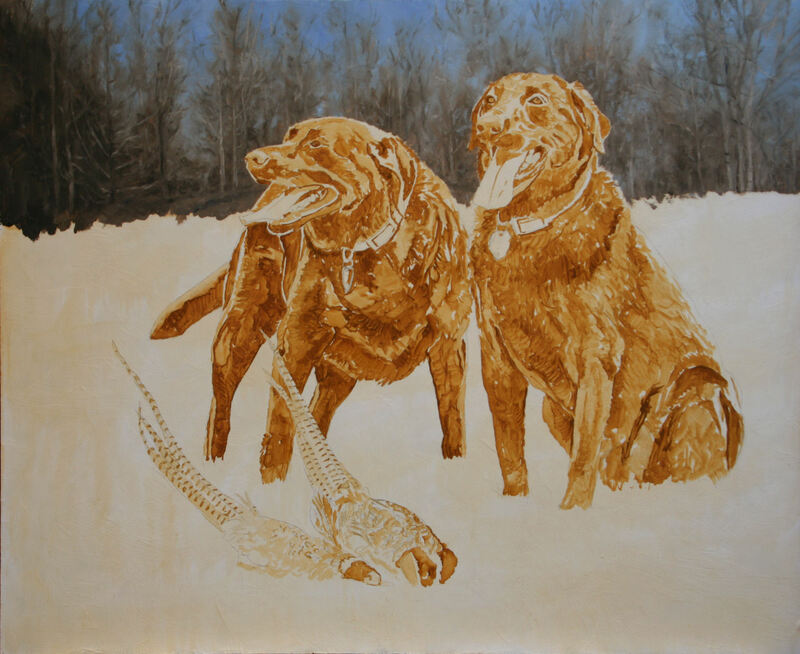 I kept the trees impressionistic, not wanting to detract from the intended detail of the dogs and birds. But, I wanted the trees to read like trees. My mission: loose trees, but not too loose. Time to rough in some grasses. As you can see, the bottom right and one spot in the bottom center, have heavy paint strokes. I wasn't sure if I wanted heavy strokes there, but thought I would try it. Something about the effect worked for me, so I kept them thick. With oil, I can always go back and change it later. I also kept the ground dark and more bare around the birds. This is done so they will be better showcased when I get around to painting them.